Summary: The sixth installment of the critically acclaimed, New York Times bestselling, Edgar- and Macavity-nominated and Alex Award-winning series by Lisa Lutz, finds our intrepid heroine of the series, Isabel Spellman, PI, at a crossroads. Izzy is used to being followed, extorted, and questioned—all occupational hazards of working at her family’s firm, Spellman Investigations. Her little sister, Rae, once tailed Izzy for weeks on end to discover the identity of Izzy’s boyfriend. Her mother, Olivia, once blackmailed Izzy with photo­graphic evidence of Prom Night 1994. It seemed that Spellman vigilance would dis­sipate after Izzy was fired for breaching client confidentiality, but then Izzy avenged her dismissal by staging a hostile takeover of the company. She should have known better than to think she could put such she­nanigans behind her. In The Last Word, Izzy’s troubles are just beginning. After her takeover of Spellman Investigations, her employees are the fur­thest thing from collegial...and Izzy finds herself struggling to pay the bills. But when she is accused of embezzling from a former client, the ridiculously wealthy Mr. Slayter, the stakes become immense. If Izzy gets indicted, she could lose her PI license and the Spellman family’s livelihood, not to mention her own freedom. Is this the end of Izzy Spellman, PI? THE LAST WORD by Lisa Lutz is the sixth novel in the best-selling Spellman series. In this latest edition, Isabel Spellman has taken control of the Spellman family private investigation firm through a hostile takeover. It hasn’t been well received by the family members working in the company which include her mother Olivia, her father Albert and her sister Rae. An ex-con Demetrius and college co-ed Vivian complete the list of employees except for Grandmother Spellman who occasionally acts as a receptionist for the business. Isabel appears to be over her head with the firm’s paperwork and finance issues and she is getting no support or cooperation from her family. Her life is further complicated because the business operates out of Albert’s and Olivia’s home. It might be worth mentioning that the Spellman family is extremely dysfunctional and as your reading about the amusing interactions among the family members, you can easily forget your reading a mystery novel. Isabel rents a basement apartment from her brother David, a stay at home dad and his wife Maggie, an attorney. David and Maggie and their unusual parenting method practiced on their young daughter Sydney add a comical aspect to Isabel’s life. There is also a serious family issue that distracts Isabel from the business. Other characters who contribute to bizarre situations in the novel include San Francisco police detective and ex-boyfriend Henry Stone and top client and CEO of a successful private equity firm, Edward Slayter. Slayter financed Isabel’s hostile takeover of the company. This, of course, makes Isabel beholden to Slayter which in turn causes further friction within the company. At about the two-thirds point in the novel several ongoing investigations that were in the background while the reader enjoyed the family antics now move to the forefront. Demetrius is helping Maggie in a pro-bono case to help free a man who was apparently wrongfully convicted. Rae, who refers to herself as a Conflict Resolution Specialist, is working with Vivian to settle a dispute with a moving company and Isabel is investigating a company for Ed Slayter. Isabel’s life becomes even more complicated when she is accused of embezzling funds from Ed Slayter’s company and someone is positioning to remove Slayter from the CEO position. THE LAST WORD is not a typical mystery novel. It is more a story about the interactions among the members of a dysfunctional family who happen to be in the private investigation business. Lutz’s happy-go-lucky writing style keeps the reader engaged and makes the book fun to read. The author’s use of amusing office memos, footnotes and appendices add to the light-heartedness of the novel. Although ample background information is available on all the characters to make the book a stand-alone novel, I can’t help but to think that a deeper understanding of the characters interactions would evolve by reading the other five books in the Spellman series. 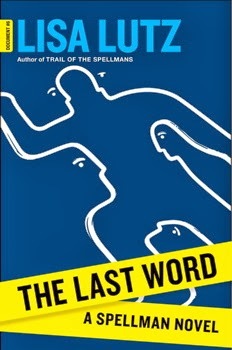 If you enjoy a little laughter in your mystery novels then I recommend reading THE LAST WORD. Thank to Booking Pap Pap for his review and to the publisher for providing a copy of this novel. By the way, I was excited (and a little surprised) to see that there is a reading group guide for THE LAST WORD. So I'm guessing this dysfunctional family might provide some thought-provoking discussion. A friend of mine raves about this series but I have yet to try it. I think I have one or two of the books and will have to dig one of them out.